Commanding a panoramic view of the city of Srinagar and Dal Lake, this temple with its square plan, recessed sides and circular inner sanctum is one of the earliest Hindu shrines extant in Kashmir, dedicated to Shiva, but as yet not firmly dated. 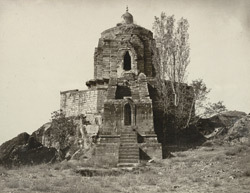 It is possibly a 7th century structure which replaced an earlier Buddhist monument of the third century BC traditionally ascribed to Ashoka's son Jhaloka. It is popularly called Shankaracharya after the 9th century Hindu philosopher-sage who visited Kashmir and is associated with it.